← First KID is born! Short Story or Long Story? Miss Gertie delivered in her own stoic way. I was on frequent watch with her throughout the day … just knowing those babies were coming. At chores, I decided she would probably wait until late night. So, my sister and I proceeded with our dinner plans. Right before leaving for town, I had to take one last peek. Gertie just contentedly chewed her cud and didn’t tell me her plans. When I returned home, I pulled the SUV up to the barn and went in for another peek. I stopped. Stood still. Stared. Then laughed and congratulated Miss Gertie on a job well done. Adding to my delight for the night, both my boys came home from college. My best friend’s daughters also came out (one of which is my oldest’s girlfriend). 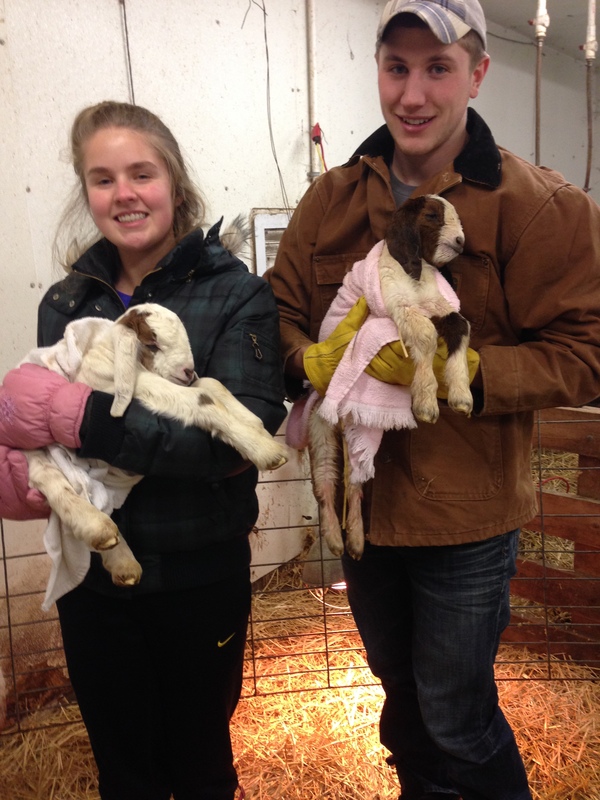 My youngest didn’t hold one because he came straight to the barn from his car and had on his good coat. I told him he was missing a good photo op! 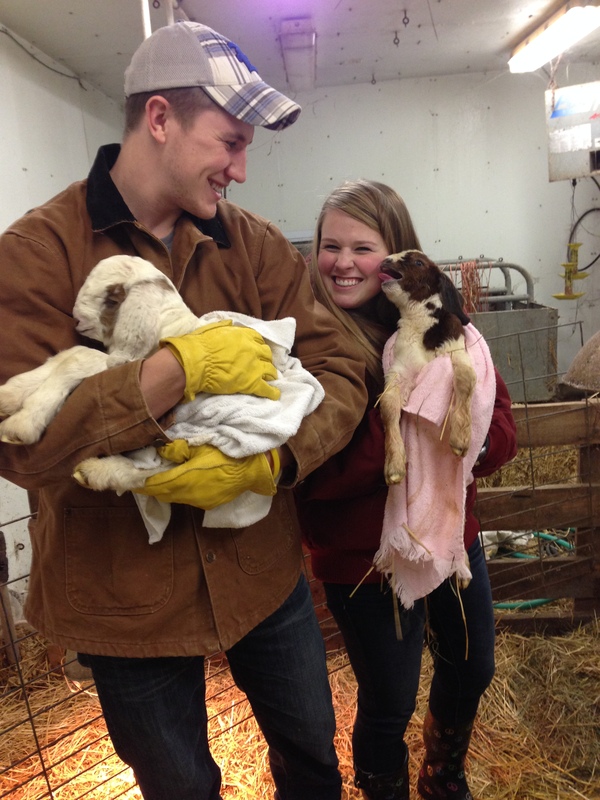 I had my “good” yet really old coat on … but still handled all the babies. I think it will clean up with a little leather cleaner. A girl’s gotta do what a girl’s gotta do. Pig-farmer missed all the excitement. He was travelling for work. Thank goodness for phones and pictures! 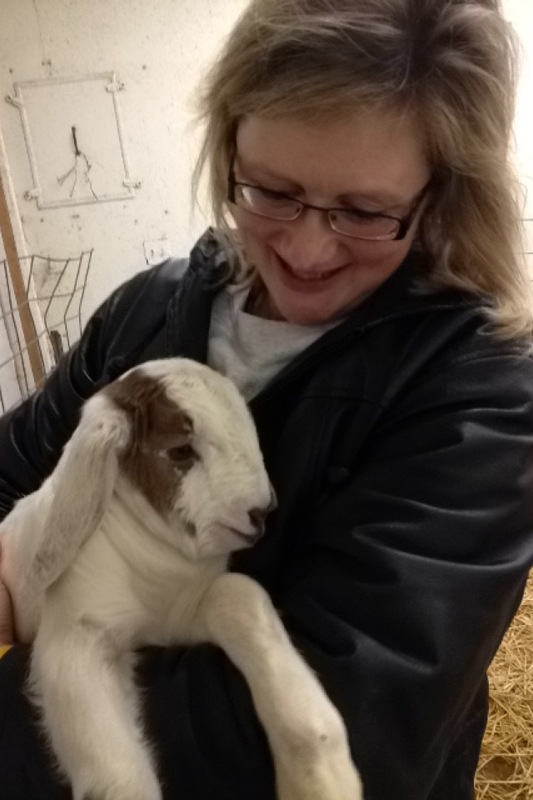 This entry was posted in Boer Goats, Country Living, Friends and Family, Work/Career and tagged Boer goats, Country life, family, farm animal photos, Goat kidding, work and career, work and home. Bookmark the permalink. 15 Responses to It’s a Boy … AND a Girl!! Oh yay! They were worth the wait!! Adorable! I love the pic of the one licking your besties’ daughter’s face!!! Awesome! I have had to learn a lot of patience, waiting on these babies. They are a picture-takers delight! They are absolutely adorable!! I am so glad that everyone arrived safe and healthy. Would love to come love on the babies, but believe I will wait until it warms up! Looking forward to paying Happy a visit one of these days too!! I just gotta repeat what everyone else is saying — cute, cute, cute. 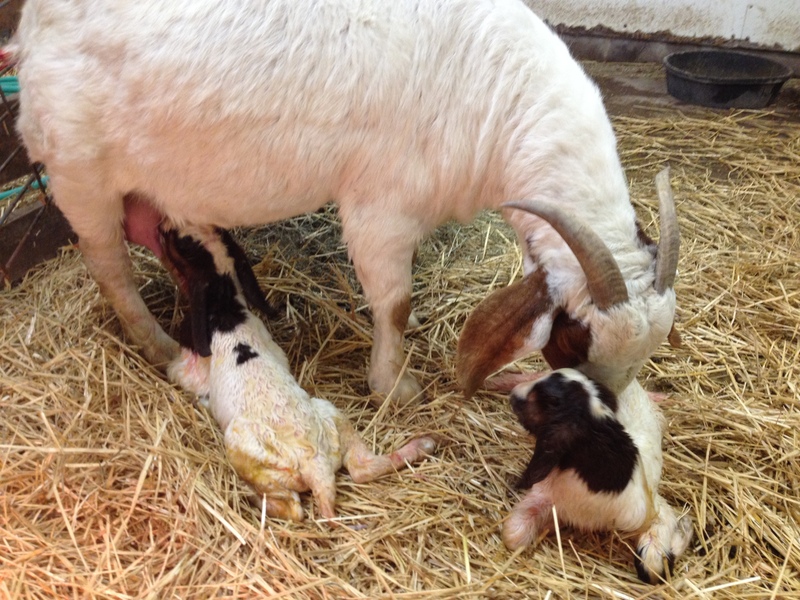 And now you have THREE new baby goats! I see their hooves in these photos. Got another question. Can pigs bark? My neighbor has a giant pig and a small pig. Something over there is barking and driving me nuts. I can see the pigs but no dog. Pigs do have quite a range of sounds … one does sound similar to a bark. I’ve been following all your new baby posts with delight. It’s so fun that they’re finally here. I also love showing my daughter your posts. I think she’d love to have a farm life like yours when she grows up. 🙂 Me? I’m too lazy. It is great … but I tell you, when it is 25 below zero windchill, I despise getting out of a warm bed during the night to check on the animals! If I could just slip on flip-flops and a jacket, I would be happier! Good job Gertie!!!! Those are two adorable little kids!! What a lovely surprise to come home to! So adorable! They are a highlight to my day!